Community leaders are pledging a fresh focus on disorder and anti-social activity in parts of Levenmouth. In particular, there is a desire to get domehawk cameras back up and running in Kennoway in a bid to quell recent incidents of yobbish behaviour and violence, which had prompted an outcry from local people. Mike Collins, Police Scotland’s Community Sergeant in Levenmouth, told a meeting in Leven’s Arden House last week he had gained permission for one of the operational domehawk devices to be moved soon from Methil to Jordan Lane in Kennoway. 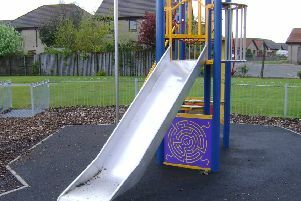 Councillor Tom Adams, Levenmouth’s area committee chairman on Fife Council, has also said he and other colleagues were determined to improve the camera coverage in the area, and money was available through the area budget or community safety panel funds to buy more domehawk cameras if necessary. Domehawk cameras were adaptable and could be moved around different areas, making them an effective deterrent against crime. However, people at a public meeting last week in Kennoway were heavy critical when it emerged one domehawk device, used locally, had not worked for almost a year, as a design alteration had rendered its batteries incompatible. Cllr Adams said he and fellow councillors and area service bosses would be seeking a meeting with police chiefs to discuss implementing new cameras if they were bought. “We have given that commitment (to improve camera coverage) and we have to follow it through,” he said. Sgt Collins also assured residents at Thursday’s community ward surgery in Leven that the open-space CCTV cameras in Kennoway’s Bishops Court were working and properly maintained, and were monitored 24 hours a day.